News from The Wave Gallery and Girvan Pottery, Girvan, Ayrshire. 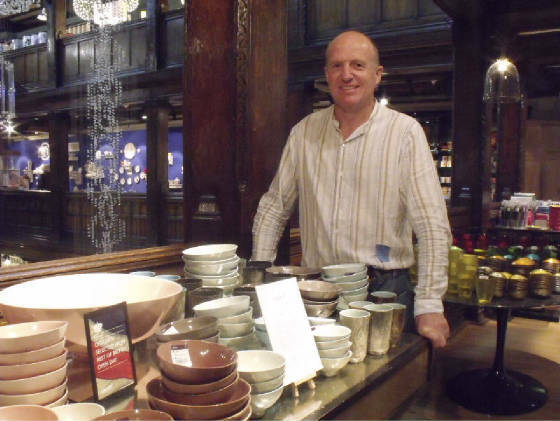 One of Winifred's former students at The Girvan Pottery is Tom Hopkins-Gibson who was featured in a BBC2 programme, ‘The Next Big Thing', presented by former Dragon's Den entrepreneur Theo Paphitis. The programme followed Tom as he succeeded in securing a commission from London department store Liberty. He recently moved back to his home town of Auchinleck in Ayrshire where he is refurbishing an empty furniture showroom to turn it into a workshop and gallery. Tom is one of 25 artists selected by Craft Scotland to showcase their work at Philadelphia Museum of Art in America.